440 12th Street Northeast, Unit 101 is true loft-style living on the Hill! 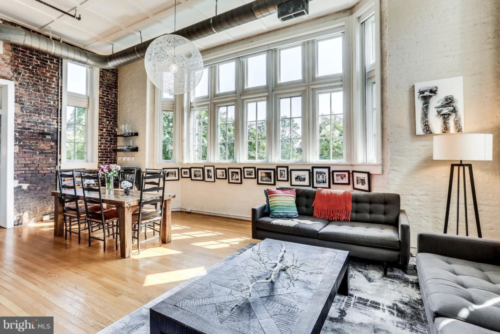 This sun-soaked 2-bedroom corner unit with exposed brick, soaring ceilings & extra loft has an open layout, a chic gray modern kitchen, hardwood floors and tons of storage. In-unit washer and dryer, as well as reserved gated parking. This is an ideal Capitol Hill location, close to H Street, Lincoln Park, the new Whole Foods & more. Open Sunday, September 23, from 2-4 p.m. and listed at $579,900. Want to take a virtual tour? CLICK HERE!